Na-Krul is the final boss of Hellfire, found in a small box on level 4 of the Crypt. He's got hit points similar to those of Diablo, and is faster in most movements, but he lacks any spell or ranged attack, which makes him somewhat easier than Big-D.
Na-Krul can be released via a lever or by reading, in proper order, the three books set before his cage. He loses half his hit points and takes a big deduction in AC and a huge reduction in resistances if you read the books. See the Na-Krul quest page for more about the books and his special Easter Egg speech. * Like Diablo, Na-Krul is also immune to Stone Curse. * Due to a rollover bug, Na-Krul actually has 14% to/hit on Hell difficulty. Ha, ha, ha...Free! Ha, ha, ha...Free to confront the one who banished me to the void, Diablo! And free to reward you, little mortal with your death! What?! Who dares disturb the great Na-Krul?! Your life is forfeit, mortal! Out of my way wretched human! 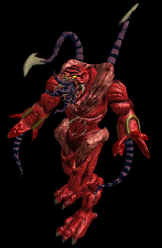 Retribution calls for he, whom you call... Diablo! He also has an Easter Egg dialogue that's enabled by the command.txt option. Hi! I'm free, free to confront the little man who banished me, Diablo. You'll get to meet Steven Tyler and the whole band. This Friday at the Coliseum. Thanks for getting me out of there. His speech is the same whether you free him with the lever, or by reading the books in sequence to weaken him. This page was last edited on 21 June 2013, at 19:26.